If you’re new to water pipes, or if you’re just wondering if you’ve been doing it wrong all these years, knowing exactly how much water you’re supposed to put in a bong is essential if you want the best smoking experience possible. If you don’t have all of the slits and the main opening of the downstem submerged, you are bypassing the water filter, essentially, making the piece nothing more than a really big hand pipe! How Much Water to Put in Double Perc Bongs? Well, the concept is the exact same as your diffused downstem, you need to have just enough water to submerge all of the openings. Some percolators don’t have plain as day slits. Some percs, like the honeycomb perc and vortex disc perc, are flat perc. With a style like this, you need to have the entire perc submerged a half inch or so under water. How to Fill Bong with Water? 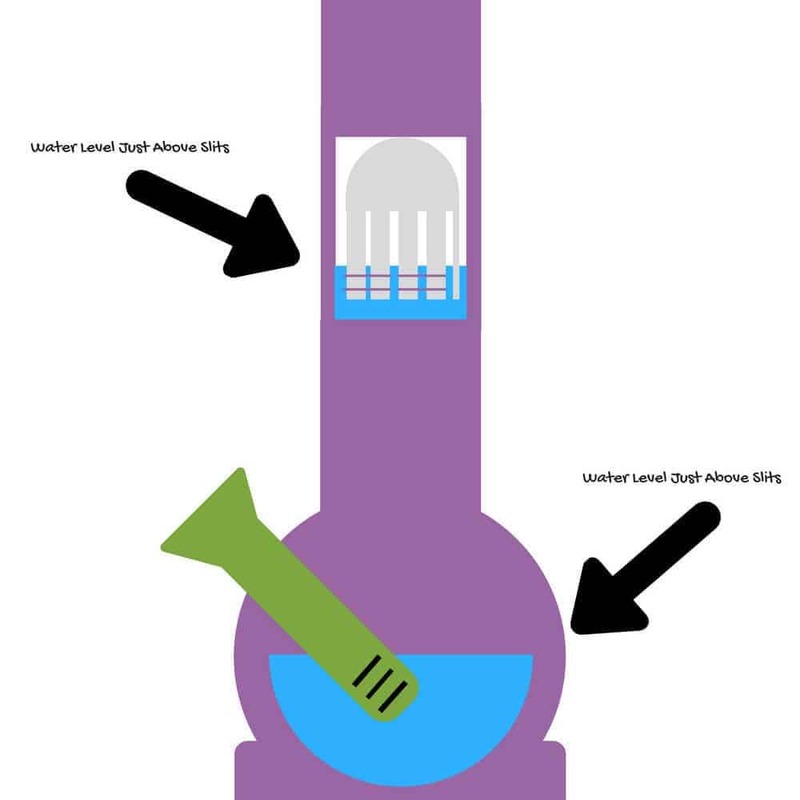 So now that you know how much water to put in a bong, knowing how actually to get the water in might be useful to you. For a regular water pipe without any extra percolators, the process is really simple. You can just pour water through the mouthpiece of the bong into the base until you have reached your desired level. Or you can pour water straight from the downstem into the base of the bong. However, if your bong does consist of multiple chambers, all with percs, then it can get a little more complicated. When filling a bong with multiple percs with water, you’re going to want to pour the water into the tube from the mouthpiece, and from there the water will start to make it’s way down. If you have a really high-quality bong most of the water will do its work for you, so just let it work its way down. Once the water has settled, check to see if all of your percs and downstem are properly submerged. If they aren’t, then simply tilt the bong sideways to allow the more water to continue to fall to the desired chamber. Do this process until your downstem and percs are properly submerged. If you happen to overfill a chamber, then tilt the bong to move the water to the chamber below it, and then to the base of the bong. From there, you can pour the excess water out through the downstem. What is the Water Doing and Why Does the Level Matter? Basically, water is filtering out a lot of the harmful stuff that comes with smoking. Also, it’s aerating the smoke, cooling the smoke on its way to your lungs. Your water level is important is because if you have too much water in your bong, then it’s going to be harder to smoke. The more water there is, the harder your lungs have to work to pull the smoke through the water. The amount of water you need in your bong is not going to change if you decide to fill the tube of your bong with ice. You do, however, need to keep an eye on your water levels while you are smoking with ice. Smoke by its nature is a very hot creature, one of the great things about smoking from a bong is the water helps to cool it. While it does cool it down, it’s definitely still hot enough to melt your ice pretty quickly during a smoke session. If you let your bong water get too high because your ice melted, you run the risk of your drags being harder on your lungs. Also, accidentally getting some of that yummy bong water in your mouth!